Cancer cells marked in green and a fat cell marked in red on the surface of a tumor (left). 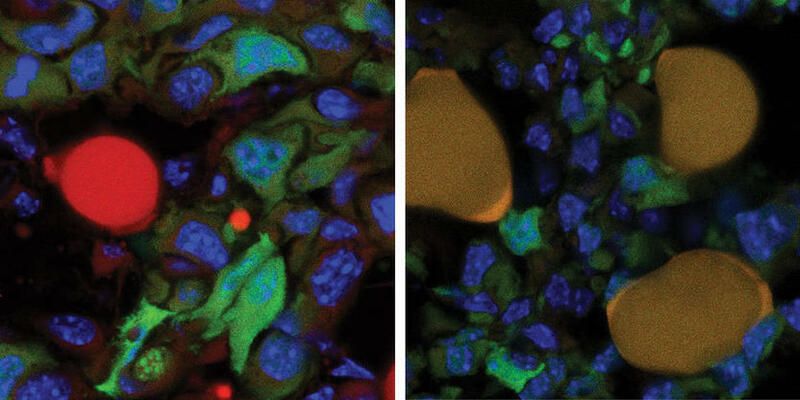 After treatment (right), three former cancer cells have been converted into fat cells. The combined marking in green and red causes them to appear dark yellow. An innovative combination therapy can force malignant breast cancer cells to turn into fat cells. This can be used to prevent the formation of metastases in mice, as researchers at the University of Basel’s Department of Biomedicine recently reported in the journal Cancer Cell. Tumor cells can adapt dynamically to changing conditions thanks to their ability to reactivate a cellular process that is central to embryonic development. This allows the cells to alter their molecular properties and to acquire new capabilities. As a result, resident cells can adopt the properties of other cell types and break away from their cell cluster. Once mobile, the cells migrate via the bloodstream to other regions of the body, where they undergo a further conversion before taking root and forming new tissue structures. In the embryo, this epithelial–mesenchymal transition (EMT) is instrumental to the development of organs. Tumor cells, however, exploit the process in order to leave the primary tumor so that they can spread around the body and form metastases in distant organs. The research group led by Professor Gerhard Christofori at the University of Basel’s Department of Biomedicine researches the molecular processes that regulate the cellular EMT program. Its aim is to demonstrate new approaches to combating the development of tumors and the formation of metastases – such as in the case of breast cancer, one of the most common and malignant diseases in women. Malignant cancer cells exhibit a high degree of adaptability – referred to as plasticity – as they undergo the cellular EMT program. Now, the researchers have exploited this property in order to develop a new type of therapeutic approach. In experiments on mice, they have succeeded in using a combination of two active substances to convert breast cancer cells, which divide quickly and form metastases, into fat cells that can no longer divide and can barely be differentiated from normal fat cells. This stops the tumor from invading the neighboring tissue and blood vessels, and no further metastases can form. This novel differentiation therapy is based on a combination of two drugs: Rosiglitazone, which is widely used to treat patients with diabetes, and Trametinib, which inhibits the growth and spread of cancer cells. “In future, this innovative therapeutic approach could be used in combination with conventional chemotherapy to suppress both primary tumor growth and the formation of deadly metastases,” says Professor Gerhard Christofori. Furthermore, the research findings show that malignant cancer cells – like stem cells – exhibit a high degree of cell plasticity, which can be exploited for therapeutic purposes.